Like the Biblical account of creation, with Adam and Eve consuming the forbidden fruit in the Garden of Eden or the construction and destruction of the Tower of Babel, the story of Noah reflects the Bible's cyclical accounts of mankind's overreaching and its consequent punishment. Darren Aronofsky's new film, "Noah," changes a good deal in the familiar tale of Noah and the Ark, in effect boldly creating a new mythology on the foundations of the old. To begin with, a voiceover provides a whole new account of the history of humankind after the Fall, a strange and utterly preposterous tale of an industrial civilization established by the descendants of Cain -- all of this thousands of years ago -- which ultimately pollutes the Earth, turning it into a wasteland. Aside from Noah (Russell Crowe) and his family, apparently the only good people left, a group of fallen angels expelled from Heaven inhabit that barren world, strangely turned into animated piles of rock that lumber about, waving their multiple arms and growling like cement mixers. They defend Noah and his family against an attack by the other folks, throngs of Cain's tribe, led by an angry villain named Tubal-cain (Ray Winstone). A vision of water inspires Noah to build the famous ark, with the help of his family and those articulated rock piles, and further, on instructions from God, always called the Creator in the movie, fill it with all the Earth's living things. To keep the enormous floating zoo quiet and livable, Noah's wife Naameh (Jennifer Connelly) ingeniously concocts a sort of incense that knocks them all out -- the birds, the insects, the reptiles, the elephants, etc. -- so they can sleep for the requisite 40 days and 40 nights. Aronofsky also improves on the Old Testament by elaborating the bare Biblical sketch of Noah's family, creating tensions between him and his two older sons, Shem (Douglas Booth) and Ham (Logan Lerman). The director turns Noah into a gloomy, deranged tyrant, who believes that mankind should simply vanish after everyone in his family dies, and therefore resolves to murder the newborn children of Shem's wife, Ila (Emma Watson). Another conflict that the Bible somehow missed results from the presence of a stowaway on the ark, good old Tubal-cain again, who temporarily persuades Ham to betray his father and attempts to kill the skipper. Although many of the events and people in the Old Testament provide appropriate subjects for epic treatment -- Moses and David, for example -- Aronofsky's effort grows ever more ludicrous as it piles on bizarre inventions and ridiculous creatures. The inclusion of all sorts of other people to flesh out the tale -- not only Tubal-cain and his thousands, but also Methuselah (Anthony Hopkins) and flashbacks to Adam and Eve presented as glowing silhouettes -- suggests a kind of directorial desperation. 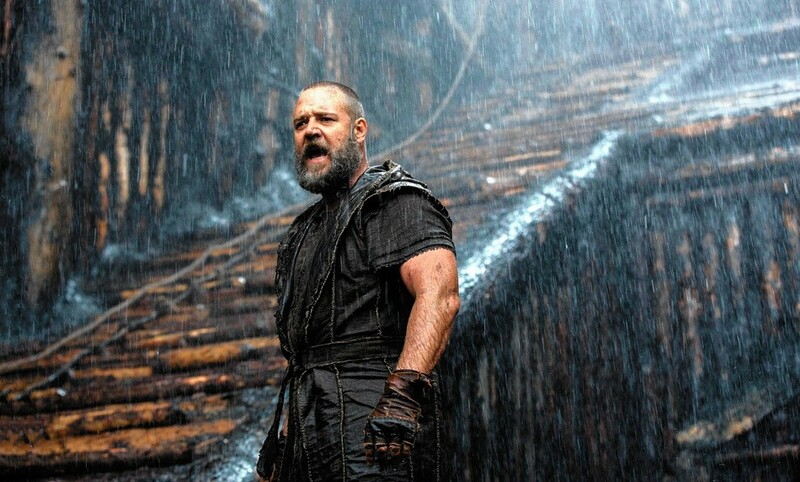 Thanks to the wonders of computer-generated images and all the paraphernalia of contemporary technology that so many viewers and reviewers mistake for filmmaking, "Noah" overflows with myriad special effects, which may in fact provide the major appeal, if any, of the film. The sequences showing all the creatures of the Earth, from butterflies to elephants, heading for the ark make for a most impressive series of images -- it's hard to resist a shot of hundreds of snakes slithering hurriedly toward salvation. Among all the remarkable effects, probably the most spectacular involve the actual flood, which begins with multiple waterspouts shooting out of the ground to meet the torrential rains from above, creating the ocean that covers the Earth and floats the enormous vessel. That particular sequence suggests the great triumph of Hollywood over the Bible itself. It shows what God would have done if only He had the money.